The art of voice-over and dubbing is a difficult art in itself. Knowing the language, a word, especially in the voice-over and dubbing area without making a dialect, with the right diction-articulation and accurate intonation to be able to sound and deliver this to the audience is a very hard job. In order to dominate all this, it is necessary to work seriously in the field of vocal arts. The brain, after the birth memorises the voice it heard and then begin the process of using the words in this direction to eliminate the problem caused by the brain’s misuse of the word used in memory, after passing the basic training in order to make the most of it. In order to be able to say a word correctly, it is necessary to have a certain study and experience for it to be able to become an angelic activity after wiping out the old language habits and embracing the truth. The feeling that is intended to be delivered to the opposite side with the speech of all these narratives is sincerity. Basically, in order to convey this emotion that must be felt to the opposite side by a script of speech, it is necessary to have the skills described above. In order to show sincerity, the voice talents and the dubbing artists should be able to portray a character suitable for the content described by the text. These are the characteristics that the voice talent has to sound like. Another criterion sought in people who perform as voice talent is acting. The right feeling can only be passed on to the other side by doing all these things together. The art of voice-over, which is known to be wrong in our society in particular, is not a simple art as it is known. Rather difficult. A actor must be free to use, without gesture, facial expressions and body language, only to be able to move the whole sensation towards the opposite side with only their voice. In order to overcome this difficulty, while the dictation-articulation skills of the mother tongue are taken away from the mouth and the dictation-articulation skill is developed, the voice actor who needs to be present to the extent that the musical ear and acting ability is required, should convey the text to the listener in a sense of sincerity. Those who can fulfill this requirement are called voice actors, and the art of voice acting is called microphone acting. Microphone acting shows itself more in the media production industry. Dubbing artists are also microphone actors. Microphone actors are the masters of vocal who are equipped with high level theatrical and dialectic abilities. What Is IVR? How To Record An IVR? 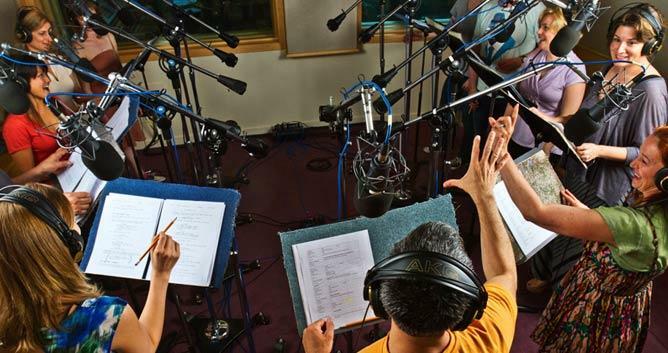 What Is Cinema And TV Series Dubbing? What is Color Correction and Color Grading? In Which Language Would You Like Your Voice? How The Commercial Voice-Over Prices Are Determined? We provide some of the best professional voices around the world in Turkish, English, Arabic, German, French and much more. BiberSA Production offers solutions within the day. We would be happy to see you in our studio, in Istanbul. © Copyright 2010 - 2018. BiberSA Production Voice-over and Dubbing Agency web page content cannot be copied or used without permission.